On Tuesday, February 28, CSC’s London Chapter is hosting a dinner meeting at Fanshawe College to explore best practices for interior insulation retrofits for old masonry buildings. Back row: Father Claude Grou, rector of Saint Joseph’s Oratory, Carlo Carbone, jury president, with Manon Asselin of Atelier TAG, James Bridger of Architecture49, and Québec’s higher education minister Hélène David in the front row. 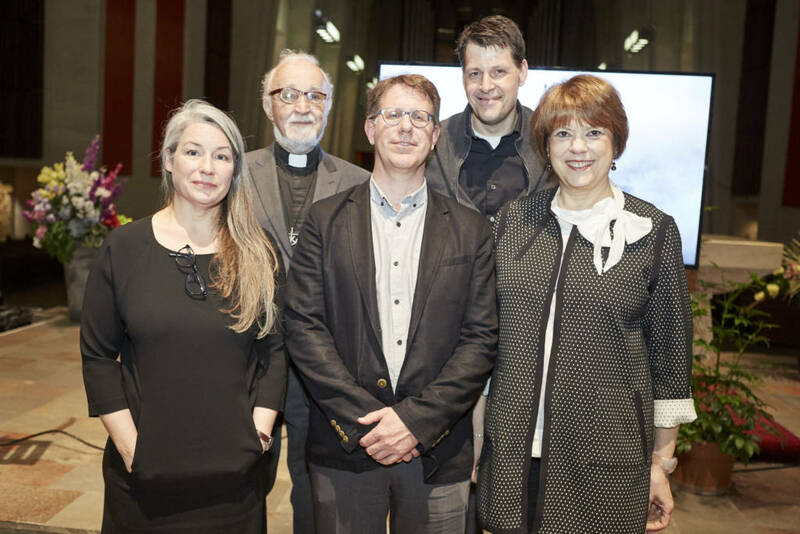 Saint Joseph’s Oratory of Mount Royal in Montréal has revealed the winner of a multidisciplinary architectural competition launched last December. The concept behind the winning project incorporates physical, historical, and spiritual elements into the reconfiguration design for the inside of the Basilica’s dome and the museum spaces. The proposed design features a pathway through the museum and inside the dome, extending the oratory’s pilgrimage experience during an ascent that is physical, historical, and spiritual. The jury found they had demonstrated a particular attentiveness to the needs of Saint Joseph’s Oratory, with their project demonstrating respect for the existing infrastructure and an emphasis on the presentation of the sites. The proposed architectural layout will take the form of a drapery revealing the oratory’s different construction periods, and provide a unifying experience throughout the pathway. The staging, materials, and architecture will work together to guide the visitors through the various stages of the ascent, creating an intimate experience with the space. “The selected project honours the importance of having a design that aligns with the historic mission of Saint Joseph’s Oratory of Mount Royal and finds an exemplary way to achieve the vision of those who first built the basilica,” said Father Claude Grou, rector of Saint Joseph’s Oratory. Eighteen teams participated in the two-step selection process. Construction is slated to start in 2020. The project will also create an observatory at the top of the basilica.